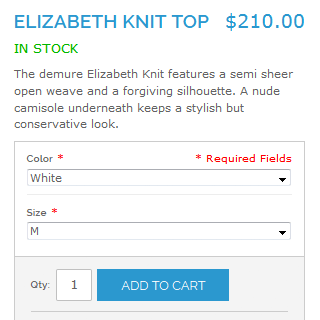 Enable visitors to quickly view product details and add products to cart right from the pop-up window on a category page. Reduce time on catalog browsing and enhance customer experience. 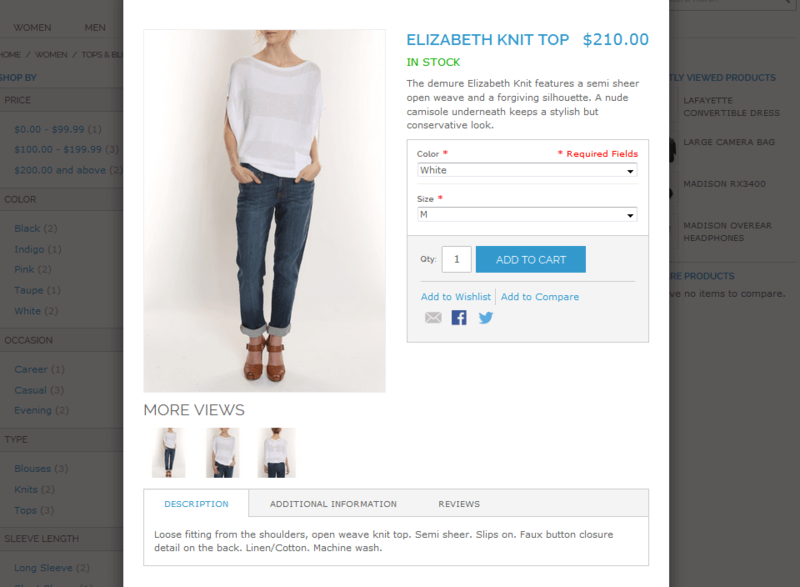 View product details on a category page. Image zoom in a pop-up window. Multiple actions in the pop-up window. Want to make your store navigation as clear as possible and provide customers with ultimate shopping experience? With the help of Magento Quick View extension you can simplify catalog browsing process and let customers instantly view product details right on a category page. Due to a handy pop-up window containing all necessary product info customers can make purchase decisions much faster and easily add products to cart right from the pop-up. Quick View module is compatible with all Magento themes and it flawlessly works on all mobile devices. It's also highly compatible with any Amasty and 3d party modules for product pages. Easily configure the Magento product preview window for your frontend website theme and customize the Quick view button according to your needs. With this quick view Magento tool customers can instantly get all necessary product information right from a category page without spending time on visiting numerous product pages. Everything they need to know is placed in a fancy preview window. Besides getting detailed information customers can easily add store items to cart and perform other actions from the Magento quick view product window like if they were on a product page. Redirect to the shopping cart page after Add to cart button is clicked in the Quick View pop-up. Can I customize the Quick View button? Yes, the Quick View button, as well as the Magento preview window, can be customized in keeping with your needs. See the instructions below. What actions are available on a quick view page? Magento AJAX quick view includes all usual actions like choosing an item configuration, adding it to wishlist/compare, read and write reviews, etc. The extension is exactly working how it is described and can be expected from the preview. I need support to change background color in the hoover window. Support was great and quick. In general I have made very good experience with all my extensions from amasty. Good Support and no problems with refund. It was the third extension we were trying on our store. The previous ones had issues with our very custom and complex theme, and the vendors refused to do anything with it. When this extension showed discrepancies we reported them and were actually eager to ask for a refund (again) but withing 1 hour we received an email from the support team - they explained how to fix it. Nice work and keep up guys. You saved me several hours of an experienced developer. Installation und Einrichtung war kinderleicht, bloß genauer Doku lesen. Module worked out of the box and did what I needed it to almost immediately. There was a small conflict with the "Cloud Zoom" module on my site which the Amasty team resolved immediately. The support this developer can only be described as "above and beyond". Any time I have needed any assistance with any of their modules (including due to conflicts with other modules) they are always willing to go the extra mile to assist! Good plugin, I like it a lot. I’m sure that this extension facilitates customers’ shopping and gives them positive experience. I think it should increase order amount, ‘cause allows customers’ view more products in less time. Popup window with all the necessary product information and add to cart button looks really nice on our online store. I just would like zoom to be a part of this extension too. It is really important when you choose a product. Unfortunately, we had to urgently search for some separate zooming tool to make this feature work. I also recommend implementing rotation feature. Enabling customers to turn a product and examine all views before making the actual purchase should really boost orders. I’m still testing this tool but have some thoughts about it. On the one hand, an ability to preview products leads to decreasing pages per visit stats. 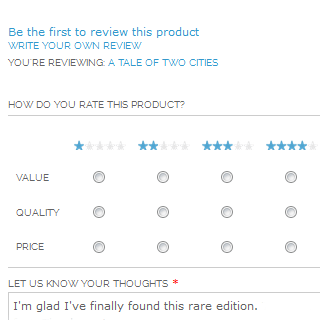 On the other hand, such preview is good for customers (according to my survey ). So I’ll continue using this feature. As for the extension, it has quite interesting settings I haven’t even thought about before buying. For example, people can add products to carts and wishlists right from the category page. But I’m experimenting on the settings to restrict some of them in preview, so customers will have to visit a product page to complete some actions, for example to write a review. I didn’t expect much from such an easy tool, so the only crit erion was its seamless work. Apart from that, easy display customization (button color, background etc.) is a great plus. 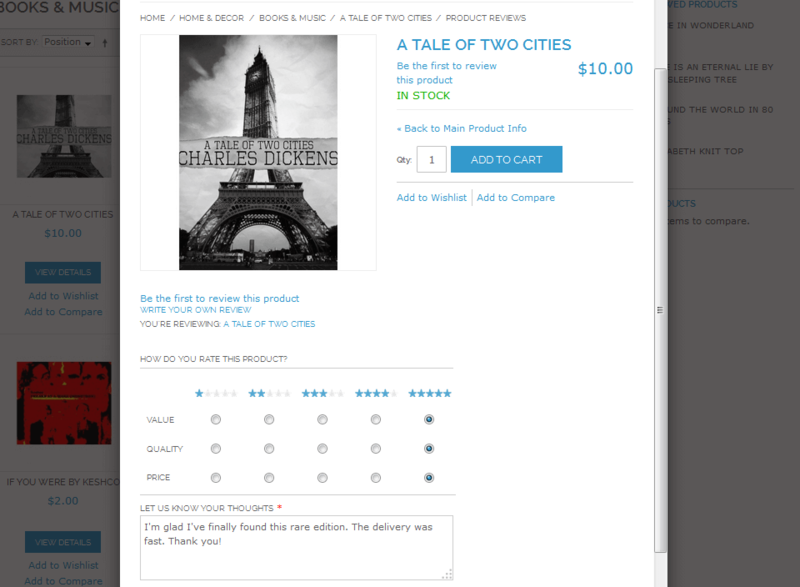 I do recommend the module to everyone as one of the easiest ways to visibly improve store usability. 2) It works perfectly on all devices, including mobile and tablet. Thanks to the company for selling the same features as you promise. Wow, this really improves the site experience. We love this extension (like most of Amasty extensions, and we use a lot of them). Very easy and effective, does what it should and makes online shopping with Magento more convenient for customers and visitor.